Graham Westley was a major influence on George Boyd's early career. Anyone who helped George Boyd’s career can’t be all bad. 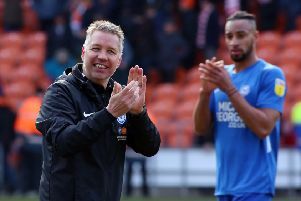 Mind you Darren Ferguson also played a big part in Boyd’s rise from non-league to Premier League and few Posh fans would want him back in charge of first-team affairs any time soon. New Posh manager Graham Westley, who will be confirmed as Posh boss today (September 21), has a tough job. Not just because he inherits the weakest Posh squad in recent seasons, one scrambling to keep themseleves out of the League One relegation zone. He will also have to win over a sceptical public. Only 1% of those who voted in a Peterborough Telegraph poll last week wanted Westley to become the permanent replacement for Dave Robertson, the same as former Coventry boss Steven Pressley and fewer than Steve Evans, a manager who polarises opinion like no other in this city. The reaction to Westley’s appointment has been poorly received by those fans who use social media. Actually that’s not quite true. His appointment has been trashed by those with the loudest, most public voice. This is a manager who probably needs to start well more than any other manager in Posh history, if only to stop Twitter exploding. Westley will also have to deal with the disappointment of Grant McCann’s failure to land the job. Not from the caretaker-boss himself as he is a consummate professional, but from fans who idolise McCann so much the last two Posh displays have convinced them that he’s the next Pep Guardiola, an exaggerated reaction of the desperation of the Dave Robertson days. Westley isn’t renowned for courting the media (journalists will tell stories of lengthy post-match waits for short interviews) which may be one reason why he often receives a bad press. Dull, route one football is a common criticism, excessive gamesmanship is another - two points well-briefed Posh chairman Darragh MacAnthony will most definitely have raised. Let’s hope so anyway. Westley would interview well, even after a tiring flight to Florida to meet his new employer, one paid for at his own expense apparently. He’s an intelligent man. I’d expect today’s unveiling to feature a manager keen to get the fans, as well as the media, onside. And we should. Whatever our personal feelings (and he wouldn’t have been my first choice) the club is bigger than all of us. MacAnthony will still be demanding an exciting style of football and Westley’s Stevenage team did deliver performances of an impressively high tempo in their successful years. That’s not me speaking, that’s a player who used to play for the new Posh boss, one who spoke in glowing terms both of his methods and his manner. Don’t believe all you read in the papers (or on Twitter) was the gist of his message. Westley certainly doesn’t lack confidence. Much-travelled player Clarke Carlisle tells a revealing tale about Westley in his auto-biography. “A manager I wouldn’t endorse is Graham Westley,” Carlisle stated. “At Preston he strode in when appointed and made a favourable impression with his ethos and reasoning. Then it all came crumbling down. Players’ opinions are important, but disaffected players? Not so much. Westley walked into a Preston dressing room full of over-paid, under-performing journeymen. He might have been the wrong man at the wrong time at Deepdale. That might not be the case at the ABAX Stadium. Westley’s teams have won medals. Isthmian League titles, Isthmian League Cups, FA Trophy winners at Wembley, League Two play-wins at Wembley, promotions from the Conference. He steered an unfashionable club like Stevenage into the Football League for the first time and he took them into League One for the first time. In a previous spell at Stevenage, Westley picked up Boyd who was later sold to Posh for a non-league record fee of £265,000. It’s doubtful Posh turned Boyd into the technically gifted star he became on their own. Westley must have had an influence, and not just in teaching Boyd the importance of allying obvious natural ability with hard work - habits that Boyd has maintained for the last decade on his rise through the leagues. Of course discipline, organisation and effort are never bad things for an entire football team to embrace. Westley has been seen making copious notes at the last three Posh matches so it’s probably safe to assume match preparation will be thorough. Possibly Westley can return former Stevenage player Michael Bostwick to the form that persuaded Posh to pay £800k for him. Stevenage enjoyed better than a 2:1 win ratio under Westley during their glory years. He surely wouldn’t have to be that good to win over the majority of Posh fans, even the stubborn moaners who still believe Ferguson was an overall failure in his two spells at the club. Hopefully Westley will have abandoned his more unusual methods. He allegedly once notified Preston players who was in the team and who was out of it with 2am text messages. He once accused one of his players of leaking team news to an opponent. He put 21 players on the transfer list during his only summer at Deepdale. He’s clearly no molly-coddler and that certainly shouldn’t be held against him, but he will need to tread carefully now as this time he’s taking over a reasonably happy dressing room. He’s smart enough to do that. Westley’s last act as a football manager was to steer Stevenage to the League Two play-offs last May so this is a great opportunity to re-start his career at a higher level. He will not want to fail. Posh fans should now do their bit to make sure he doesn’t. The club could do with some managerial stability for a start. Despite a promising beginning, this particular job vacancy probably did arrive at the wrong time for McCann. Hopefully he can work successfully with Westley and learn from him. Whatever happens it’s unlikely to be dull.